My Thought Orchard: National Poetry Month! 2012! It's April, which means poetry every day! I'm taking the challenge again, and I hope you do too. Even if you aren't much for writing poems, I encourage you to read one every day. 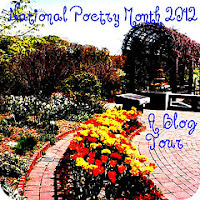 SavvyVerseAndWit is again hosting the NPM blog tour, so check out what those great poets are composing. I will be adding links to sites and poems I discover or use this month, but see also my previous links and my wrap-up from last year. There were some great ones!